I didn’t grow up on a farm. I grew up on the south side of Chicago, spent countless hours on the CTA as a kid. I rode the bus to go to the library, school, the movies, to meet friends and to visit relatives. I knew every stop on the 62 line, from my house through Bridgeport and Chinatown and into the city. I knew when I could catch an express bus and when it might be just as fast to take the local. After that, I went to college across the street from the Water Tower downtown. And then I got a job at the Sears Tower, where I worked for years til the corporation moved to the suburbs. I know the city. I am a product of the city. My grandparents on my Dad’s side had a dairy farm in northern Wisconsin. We traveled there a couple times a year and almost always during haying season, because my Dad (and other uncles) helped them to bring in the hay and get it into the loft. For those of you who don’t know, August is usually the best time for that sort of thing. Hot, dry, with long days. Fill up the hayloft with bales so the cows have enough to eat all winter. Me, I could not wait. Could. Not. Wait. To wake up early with Grandma and Grandpa, around 5 – 6 am to milk the cows. 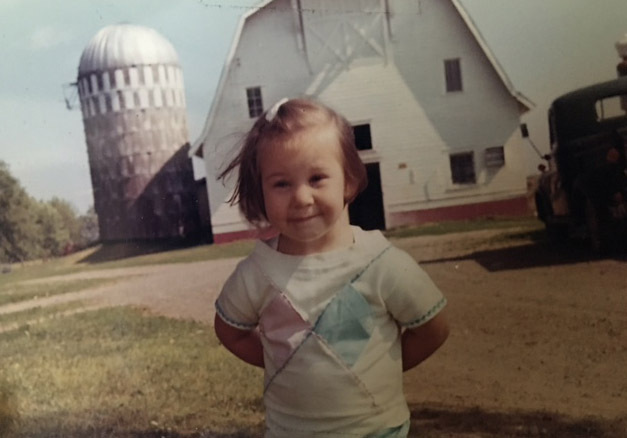 I would wear a little head scarf (like Grandma) and follow them around the barn, play with animals and taste fresh milk. And by fresh I mean straight from the cow before it goes into the strainer while it’s still the temperature of the cow. I spent hours in the milkhouse afterward having conversations with Grandma while she cleaned all the equipment. I watched her hands, I studied the underground “cool pool” where they kept the milk cans up to their necks in cold water til the milk man came to pick them up. 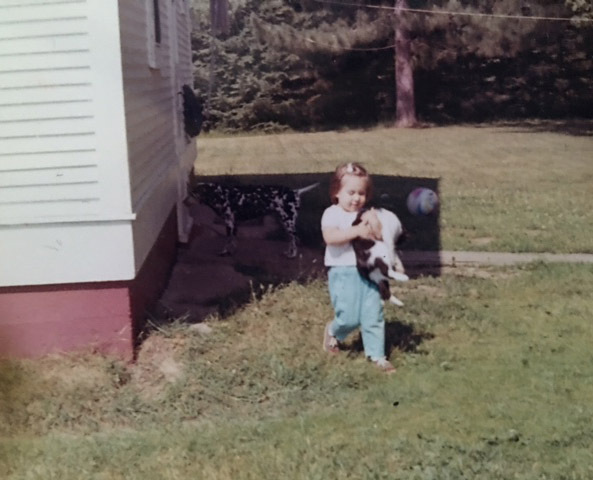 I fed and petted cows, guided them into the pasture, shoveled poop, chased kittens and chickens, and sat down to true, hearty meals. To this day, I live as far west from the city as possible, on the edge of the suburbs, where the land becomes fields and the fields become grain and the horizons are long and rolling. I drive past farms every day. I shop at their stands, I take cooking classes there, and in these long, last, few hot days of summer, I miss the work of the land and the animals. But I remember the farmhouse kitchen, where my mom and aunt always had a hearty breakfast waiting after milking time. I remember the canning and the baking and the processing of fruits and vegetables. It was a tiny room, so well-organized, and was the absolute heart of the house. 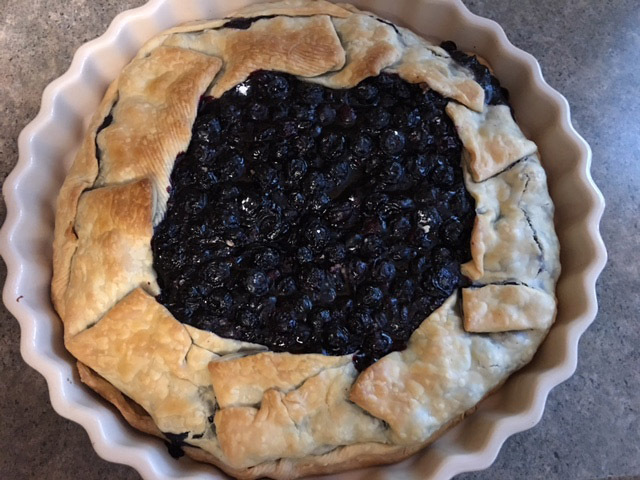 Yesterday, I made a blueberry croustade. I have been tweaking the recipe for awhile. For a long time I fiddled with making my own pie crust every time. But I soon grew tired — and frustrated — by that, and these days I mostly settle for Pillsbury which gets me 80% of the way there in .0001% of the time. Here’s to farms and haying and long summer days. 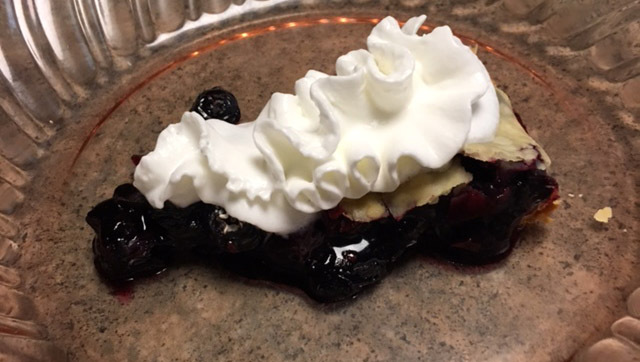 Here’s to fresh baked pies cooling on the counter top. Here’s to whip cream made from actual cream. Here’s to homemade goodness and the people in our lives who make it good. –1 package Pillsbury pie dough. You need 2 rounds. Be sure to use enough corn starch…3 teaspoons is too little. Pre-heat oven to 400 degrees. Line the dish with your pie dough. I cut up the second round to use it to curl up over the top. One pie round is not enough. You need both. Combine the rest of the ingredients. I use a cheese grater to shred the fresh ginger. I would not recommend substituting powder. At all. Use the actual ginger, peel and grate. Bake for about 30 minutes but keep an eye on it. The whole prep takes a total of about 5 minutes. Seriously, maybe 10 if you include rinsing the blueberries. Whipped cream is a must, ice cream optional. Have a great end of summer season.